The Original Kemper Pottery Tool Kit by Kemper, the most trusted name in pottery tools, is made in USA of top quality materials. The Kemper tool kit comes with everything you need to start throwing pottery. 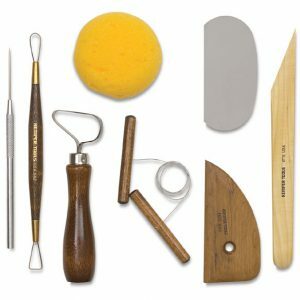 The Original Kemper Pottery Tool Kit, the most trusted name in pottery tools, is made in USA of top quality materials. The Kemper tool kit comes with everything you need to start throwing pottery. The kit contains a sponge, potters hardwood rib, steel scraper, needle tool, loop trim tool, ribbon tool and hard wood modeling tool. Don’t be fooled by cheap imitation pottery tool kits. The ribbon tools are not sharp, the needle tools break and the wood handles and ribs will not hold up in water. We know because we tried them, we aren’t just a store we are a studio.